If you’ve been following along on the blog you’ll know we’ve been working up to our first commercial beer, the Eggnog stout. That beer will be launched this Sunday 2 November at Hoo Ha Bar. In this post I’ll wrap up everything we’ve done to get to this point and go into detail about how to make commercial beer. We had an idea to brew Eggnog stout, so we brewed a small pilot batch of 20L. Read about that here and the details of the brew day here. We got excited and started designing labels, decals, hats, shirts etc. Read about that here and here. We brewed a bunch more pilot brews. We put up a post about the Goldtoast pale here. But we’ve brewed 5 more including a 9% belgian dark ale, a Black IPA and a Saison. We started talking to breweries as we looked at our options for doing our first commercial batch. We decided on Beard and Brau and went into a lot of detail about the process in this post. 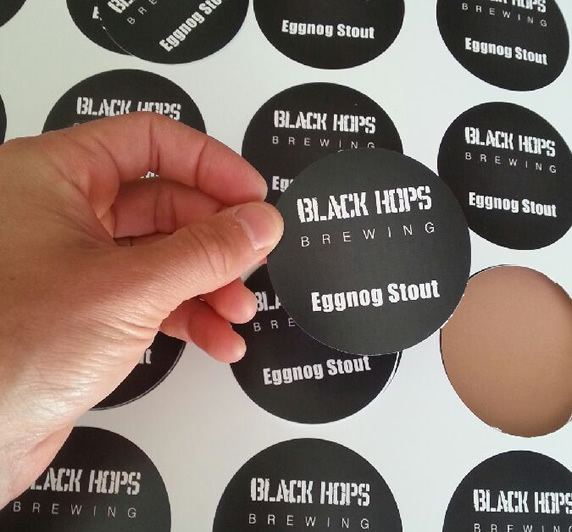 We have brewed that beer now and we are launching Black Hops and the Eggnog stout this Sunday 2 November at 3pm at Hoo Ha Bar in Brisbane. Here is a post with the details for the launch. The remainder of this post, I’ll cover the brewing of our first commercial beer, the Eggnog stout. We went into some detail around the planning of the beer in this post. However there is a LOT that has to happen between planning a beer and the brew day. Here is a summary. Contract – It took us a long time to iron out all of the details of the contract with Beard and Brau but we got there in the end. In hindsight we probably should have done less on email and more in person. Plus given it was our first beer there, we accepted that it would take a bit of back and forth. Scaling the recipe – It’s not quite as simple as multiplying everything to get from 20L to 800L. We had a lot of discussions between us and Chris to get everything right. We had to change some ingredients, and change the process from brewing on a small pilot setup. Ordering ingredients – While Chris was able to get hold of the basic ingredients, it was up to us to source the yeast and the special ingredients for the Eggnog stout. That included french brandy, spices and Madagascan vanilla (we have a good source for the vanilla if you are interested). This was pretty daunting particularly the vanilla and the brandy which can really add up on a brew of this size. Planning – We also had to arrange when we would do the yeast, when we would mill, when we’d brew, when we’d add spices and keg etc. There’s been a lot of visits to Tamborine over the last few weeks and we’ve cut it pretty fine to make our launch of 2 November. License – There is also a lot of paperwork that goes into getting a producer / wholesale license. We talked about that a little bit in this post. 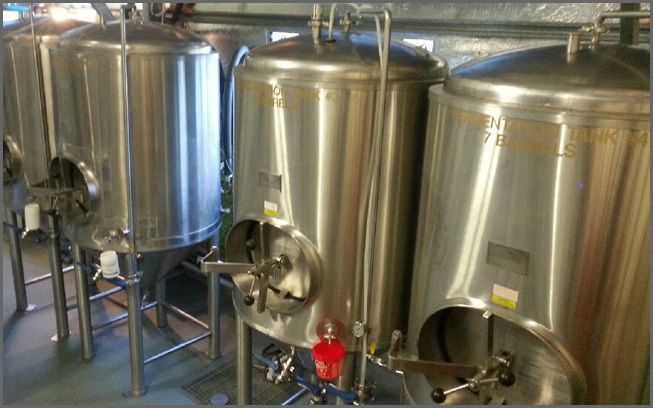 Excise and logistics – We’ve had to consider the excise and how we go about storing and delivering the kegs. In the end we decided to use Beard and Brau’s kegs, Outrayjuz for warehousing and we will deliver the kegs ourselves. Clothing – Chris insisted on steel cap boots and hawaiian shirts. Ed was on shopping duty and scored some boots for $18 and shirts for $5. Pricing – We also had to think about how we would price the kegs. We ended up deciding on $320 + GST. We feel we could have charged more but the advice we got from others was that bars would just have to charge more for the beer. When that happens people tend to only get 1 and we wanted it to be a sessionable beer. The ingredients in this beer are quite expensive so hopefully we got that balance right. Realistically we won’t know for sure until it’s all said and done. All in all it was quite a lot of thinking, talking and emailing prior to getting started. We decided to do the yeast preparation ourselves. It was a big decision because it meant that the risk for the brew fell more back on us if it didn’t work out. But this is what Govs was most comfortable with so we went about getting the yeast ready a week before brew day. Here’s a little video Govs put together for me and Ed about his process. By the end we had 40L of yeast ready to go on brew day. We didn’t have a microscope so we couldn’t take a yeast count on the day. However we’ve since bought one so that won’t be a problem next time. The mill Chris uses is quite small so it took 2-3 hours to mill all of the grain. We wouldn’t have had enough time to mill and brew on the same day. The milling creates a fair bit of dust and we wanted to have a nice clean brewery for brew day. The milling went well although it took a long time. Having used much bigger mills before, it was hard to spend hours on something we knew we could have done in minutes. For that reason, next time around we may opt to mill offsite and bring the grain ourselves. For our first brew though this was fine and there were no issues doing the milling. We were pumped to come back at 6am the next day and get brewing. 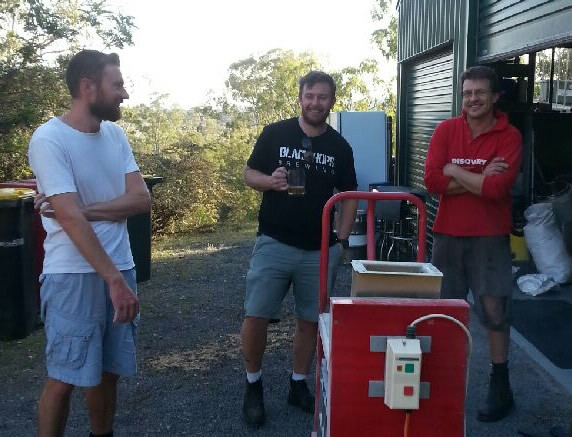 We headed up at 6am on Monday 6 October for the brew day. Chris has a rule that if you are going to work all day you might as well pretend you are on holidays. So hawaiian shirts were compulsory. Lou joined us for moral support but didn’t get the memo about the shirts, or she chose to ignore it, I’m not sure. But she did bring us vegan ham and cheese sandwiches courtesy of Chris and Tanya. Then began the process of filling it with the pre-heated water. Here’s the water going in. We then took it in turn to stir every 15 minutes or so. Chris added the yeast Govs had prepared to the fermenter. We then transferred the mash to the kettle. Here is the sparge. We added the hops, Cascade and East Kent Goldings. You can find the full recipe in this post about the eggnog stout. Then we emptied the spent grain using a sophisticated system of wheelie bins and a metal sign (which was very effective). After the boil we transferred the beer to the fermenter via the head exchanger. The head exchanger cooled the beer while at the same time heading the water for the second 400L batch of beer. Clever stuff. It meant we had to wait for the boil before we could do the second mash but it saved a lot of water. After that we repeated the whole process again to get the full 800L of beer in the fermenter. The sun set on a full day of brewing. We were all stoked to have completed our first full brew and well and truly ready for a beer. Everything went well on the brew day but there was still a lot of work to do between then and the launch. We had to organize the launch which we’ve been doing with Hoo Ha Bar in Brisbane. Those guys have been awesome and very flexible with our dates. We’ve also had to go back to the brewery for a few things. We had to go back and add the spices at the end of fermentation. Because it was our first large batch we had to do this a few times to get it completely right. Govs has been back there to add some final brandy just this weekend and we will be back there again for kegging this week. The first keg will be ready just days before the launch and will be personally delivered to Hoo Ha bar so we have something to drink on Sunday! Eddie has also been hard at work coming up with our tap decals. We might write a separate post about that as we’ve been able to do it cheaply but with great results. I’ve included a screenshot below. Of course someone has to buy the beer and through a combination of getting a bit of attention in the community and Eddie busily heading out to the bars in Brissie we’ve managed to sign up some amazing venues. All of these venues had agreed to take kegs before the brew was even done. We’ve met with most of the bars guys personally, mostly Eddie and some of them have tried the bottled sample of the beer. All of these bars are in Brisbane except for our local craft beer bar down the Gold Coast. We’ll be sure to let you know the awesome venues that tap our beer throughout November. And that just leaves our launch which is happening this Sunday 2 November at Hoo Ha Bar in Southbrank Brisbane from 3pm. Mike and the crew have been awesome, even putting this epic poster together for the launch. The launch will be a celebration of local Queensland craft beer with 3 other breweries coming on board with new beers. Chris from Beard and Brau, Gavin from Croft Brewing and the boys from Brewtal. If you are keen to come, you can join the event via Facebook or just rock up at 3pm on the day. We’d love to see you there. If you have any questions about this post, please let us know in the comments. If you want to be notified when we add new articles to the blog please add your email below.